In 1872, Elizabeth Garrett Anderson founded the New Hospital for Women, which was also staffed by women. After her death the purpose-built premises in Euston Road were renamed in her honour. Until 1988 it remained facility run by women, for women. The building is still a prominent feature on Euston Road, now part of the UNISON Centre and housing a gallery commemorating her achievements. But the detail is important. In 1865 Garrett Anderson was not allowed to be a doctor. Oxford, Cambridge, Glasgow, Edinburgh, St Andrews and the Royal College of Surgeons, had all refused to admit her. Furthermore, the Worshipful Society of Apothecaries then closed the door to anyone whose medical knowledge came from private tuition, effectively barring women from getting the same qualification. Frances Elizabeth Morgan (later Hoggan) was the British first woman to receive a Medical Doctorate, after completing the course at Zurich in 1870 (and in three, rather than five years). In fact, Elizabeth Blackwell was the first woman whose name appeared on the British General Medical Council’s medical register in 1858 (on a technicality); It was only in 1877 that the General Medical Council voted formally to end the exclusion of women. So we have a few years to go until we reach that 150th anniversary, but in the meantime there is some excellent historical work being done to enrich our understanding of women who embarked on medical careers in the late nineteenth century (see for example, recent pieces by Vanessa Heggie, Claire Brock and Jennie Brosnan). In 1870, Elizabeth Garrett Anderson did not gain her qualification as a Doctor ‘in England’ (as her blue plaque suggests), but in Paris, where she also had to answer questions on police forensics, fish and the secretion of tears. As she herself explained, as she embarked on her MD studies she ‘had to find a subject which could be well-studied without post-mortem observations, of which I can have but very few in either private or dispensary practice’. This accounting for a choice that was instrumental, rather than intellectual is a fascinating insight into the subtle workings of gender in the history of migraine. In 1870, Garrett alighted on migraine as a suitable topic for a woman, but not for the reasons we so often assume. To coin a phrase, if Garrett Anderson was making history, it was not in conditions of her own making. 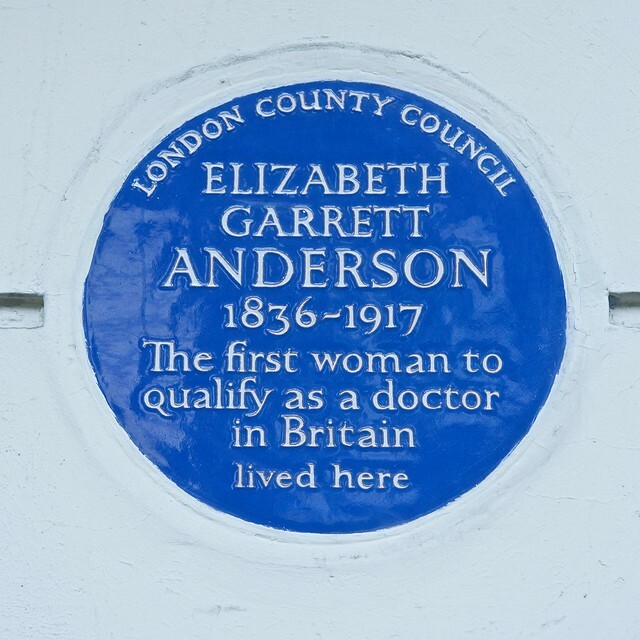 Garrett Anderson’s reputation as a medical pioneer in the professional realm – she has a hospital wing, a permanent gallery in what was the Elizabeth Garrett Anderson Hospital, a school, and a NHS Leadership Programme named in her honour – is a stark contrast to her presence in the realm of medical knowledge. Here her contribution to the knowledge of migraine is considered marginal, if indeed, it has been considered at all. She does not appear at all, for example, in Mervyn Eadie’s Headache Through the Centuries (2014). Yet Garrett Anderson has influenced modern practice: in 1966 Marcia Wilkinson set up a migraine clinic at the Elizabeth Garrett Anderson Hospital – later to become the London Migraine Clinic – and based her treatment on Garrett Anderson’s emphasis on nutrition, regular meals, regular habits, the importance of rest, and ‘great quantities of hot tea’. In 1870 Wilkinson became Director of the City of London Migraine Clinic, the first centre in the world dedicated to treating patients during a migraine attack. Wilkinson was also the first recipient of the International Headache Society’s Elizabeth Garrett Anderson Award, established in 2000 to reward work by women in the field of migraine. It is somewhat ironic that in one way Garrett Anderson was so instrumental in transforming women’s relationship with medicine, and yet the subject of her MD thesis continues to hold so many people – and particularly women – back.